John leads the Democratic Engagement Exchange at Ryerson University. In this session, John will share his experience in developing a Voter PopUp toolkit to support voter engagement and turnout and he would like to hear your experience about how to strategically organize organizations to support them on this campaign. The Voter PopUp aims to ignite interest in elections and demystify the voting process for first-time and infrequent voters. So come and join! Learn about this creative tactic and come share your experiences in how to organize organizations in order to develop his organisation’s strategy and tactics and to share his experiences and learnings with you. Prior to launching the Exchange, John developed and lead community based outreach programs for the Samara Centre for Democracy. 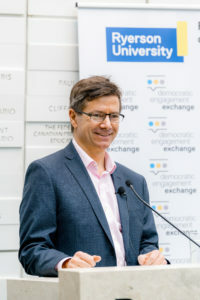 At the Samara Centre, John developed the Democracy Talks and Vote PopUp programs that have been adopted by national and regional community organizations across the country and showcased as an example of programs that work by the Canada’s Chief Electoral Officer in his report to Parliament. John began his career working for the US Congress where he served as Chief of Staff to a US Congressman and worked on several political campaigns. He has also worked as an educator and served on the board of the organization that successfully campaigned for the first system of public financing for state elections in the United States. Since immigrating to Canada in 2008, John led the development of national tutoring initiatives for Pathways to Education. He also served as founding board member and chair of Park People.